HARRY Stewart looks like an ordinary 11-year-old boy, but just last month he was minutes from death. The Kingscliff student had been exercising at home on December 30 when he collapsed, went blue and stopped breathing. The young boy was in cardiac arrest due to an underlying heart condition. 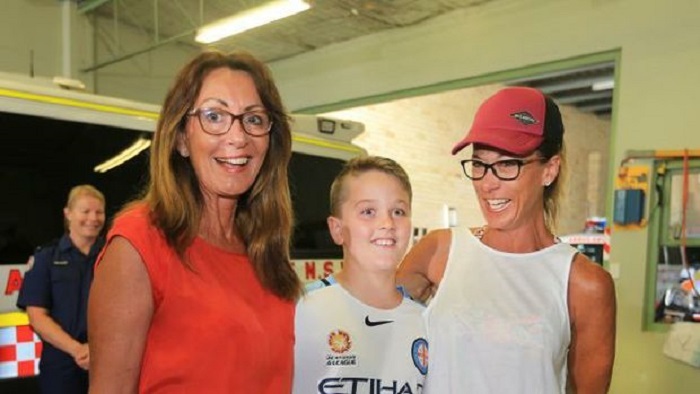 Luckily for Harry, his neighbours, Keli Martin and Sue Spence, had recently done a first aid course and were able to begin CPR while they waited for the paramedics. Ms Spence said Harry was blue and not breathing as they frantically tried to save him. "It's just so great to see he is OK now ... I'm so grateful," she said. Ms Martin said she was panicked when she realised Harry was not responsive. "As he ran up (the hill) I could tell his feet were a bit floppy," she said. "Sue was definitely the calm one ... it was not calm in my head, but Harry was just the most important thing." Harry said all he remembered was being asked if he was OK.
"Sue asked if I was OK. I said 'no' and I don't remember after that," he said. Harry's mum, Ali Pratt, said she was still counting her lucky stars. She said Harry had experienced one scare in the past, but nothing like this. "He has now been diagnosed with CPPT, a heart condition which impacts the rhythm of electrodes in the heart," she said. "Now he's got a pacemaker and defibrillator all in one, plus a tracker, so every night it sends his heart beat for the day up to the hospital. "If his heart beat goes too slow or too fast it'll kick in." The condition is not curable, Harry's pacemaker will have to be replaced every seven years and he will be limited in the strenuous activity he can do. Kingscliff Ambulance station officer Syd Francis said being called to a cardiac arrest for someone so young was their "worst nightmare" as paramedics. He praised the efforts of the neighbours and said everyone should complete a CPR or first aid course.